Contrary to popular belief, the name Parmesan does not derive from the use of parmesan cheese in this famous recipe. 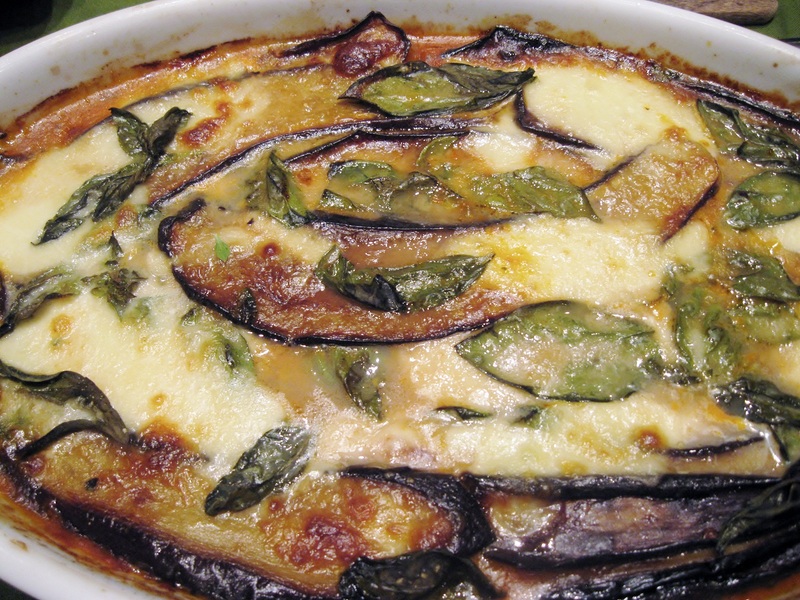 There are different hypothesis about the origins of Parmigiana. The most popular claims that it comes from the Sicilian word “Parmiciana”, meaning a wood shutter having a set of parallel slats called louvers – that the layers of sliced eggplants are supposed to resemble. Another theory is that the term “Parmigiana” means to cook like the Parmesans, the inhabitants of Parma, a city in Emilia Romagna Region that is famous for its culinary tradition. 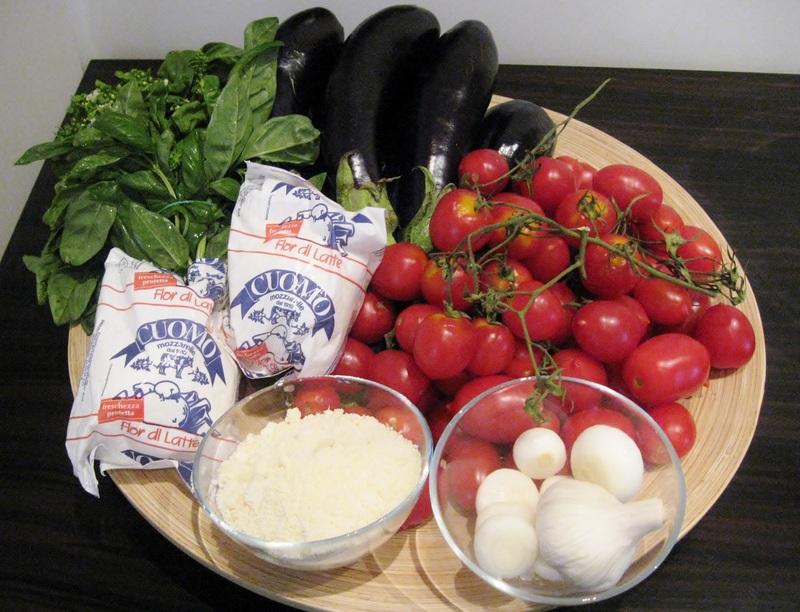 Some believe that being eggplants – the principal ingredient of parmigiana – of asian origins, most probably derives from the Turkish translation of eggplant “patlican” (literally pronounced in Italian as padmegian). As for the Eggplant Parmesan I am preparing, I am choosing Campania’s traditional recipe because my Neapolitan mother in law would never ever forgive me if I did not blog about it. 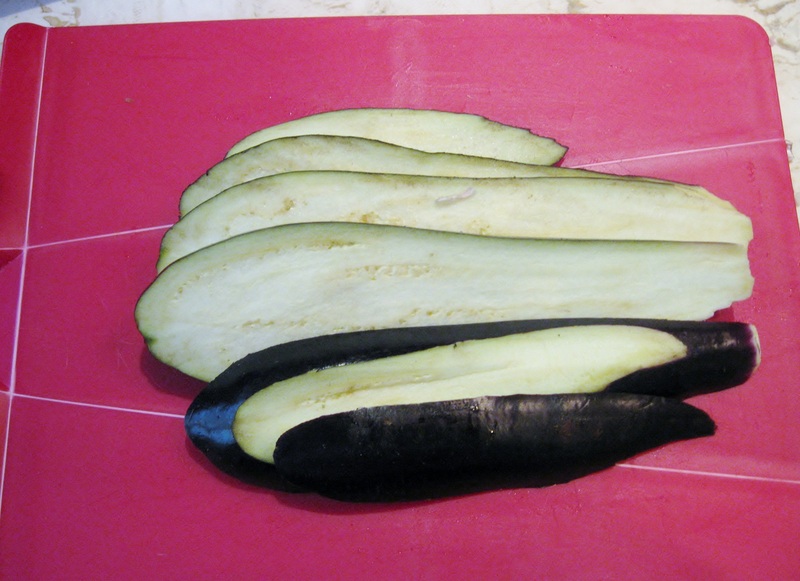 Slice eggplants lengthwise (about 4-5 mm thickness). 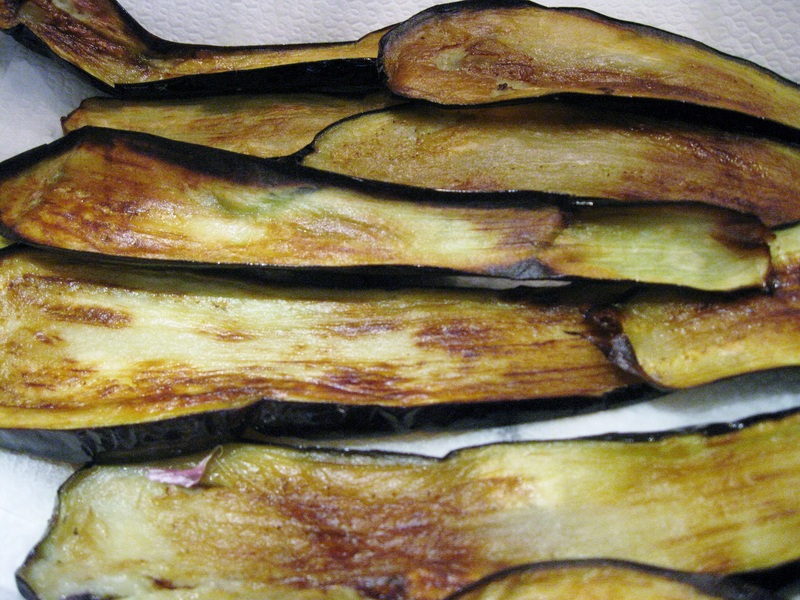 Eggplants should not be sliced too thin to prevent them from burning while frying. On the contrary, if eggplants are cut too thick, they will absorb too much oil. 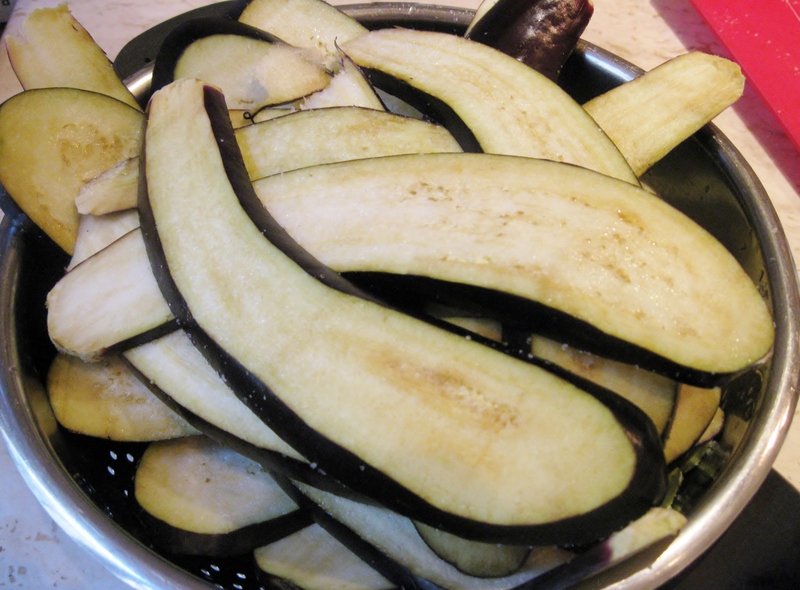 Toss eggplants with salt and place them in a colander. The secret to a liquid free recipe is draining enough water from eggplants. Some recipes suggest to let eggplants drain for about 1 hour. I let them drain overnight. According to Neapolitan tradition, eggplants should only be fried in olive oil, long enough to acquire an intense golden brown color. Fry 4 to 5 slices at a time. 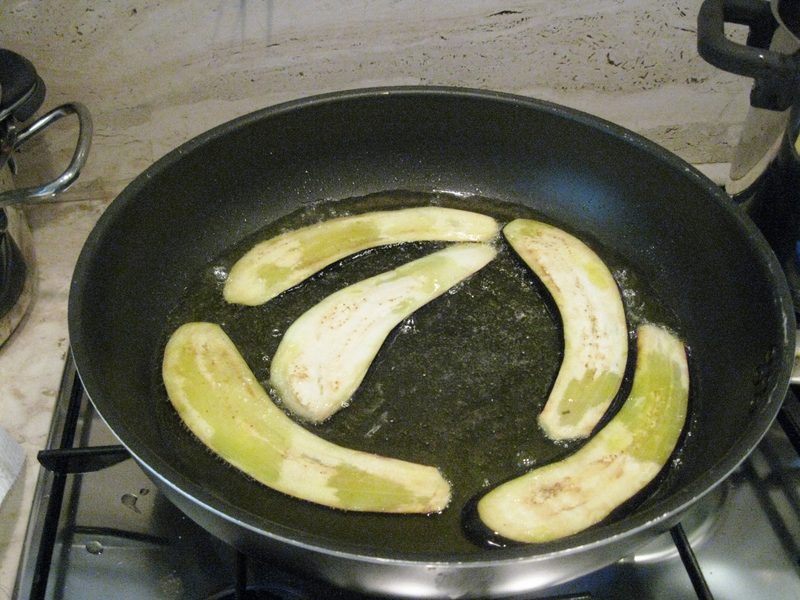 In other Italian regions, eggplants are previously dipped in egg batter or/and flour before frying. Once fried, eggplants are transferred to a plate and covered with paper towels to drain excess oil. Make sure to eliminate excess oil: there is nothing worse than a Parmigiana drowned in oil. 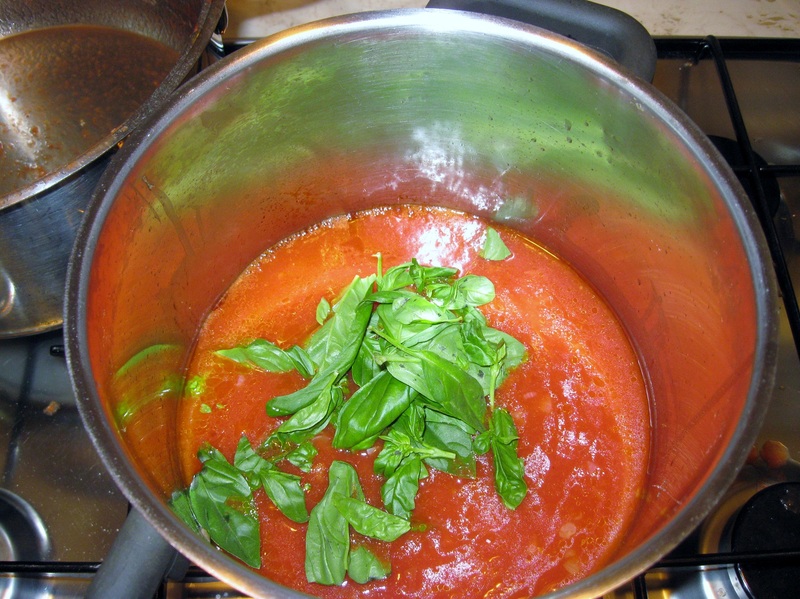 To prepare the sauce, the most recommended type of tomatoes are fresh, ripe San Marzano or Piccadilly. Many Italian cooks consider these kind of “plum” tomatoes to be the best sauce tomatoes. 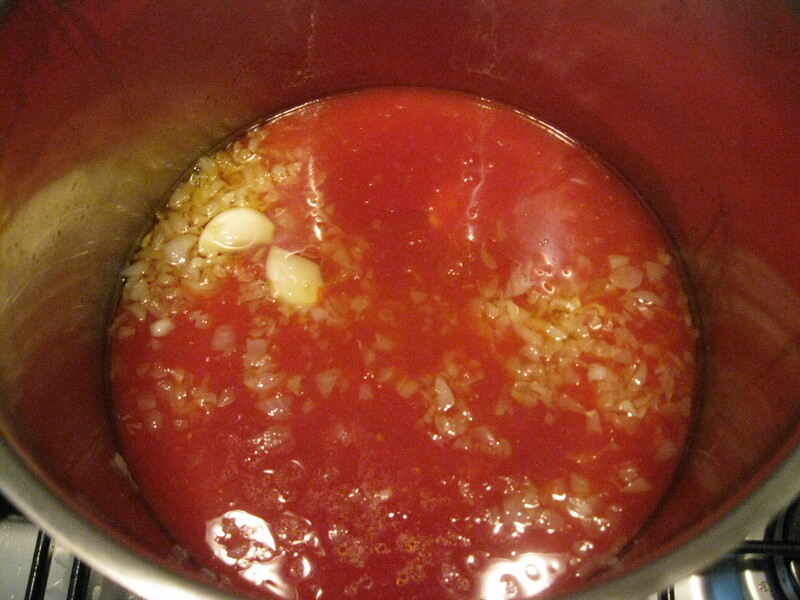 In a pot, boil water and add tomatoes, and blanche for about 1 – 2 minutes, the necessary time to soften them. 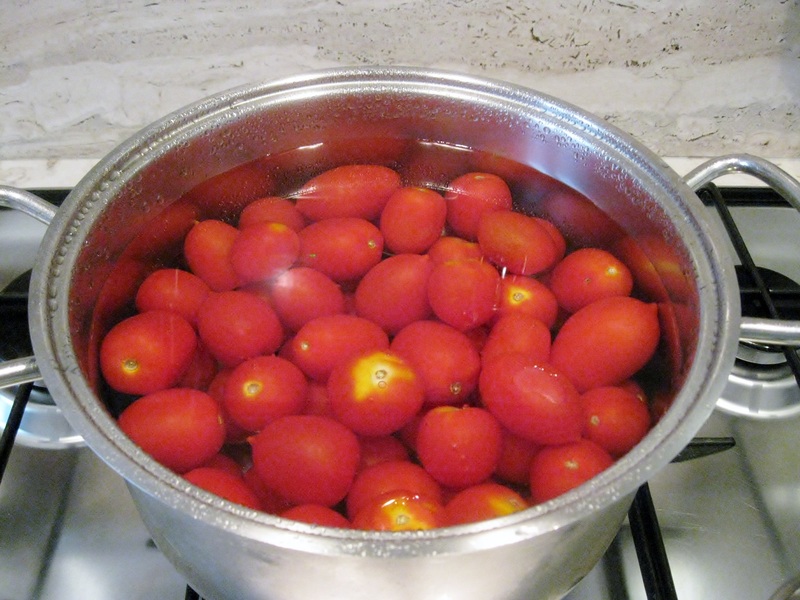 The more time you boil tomatoes in water, the more water they absorb. 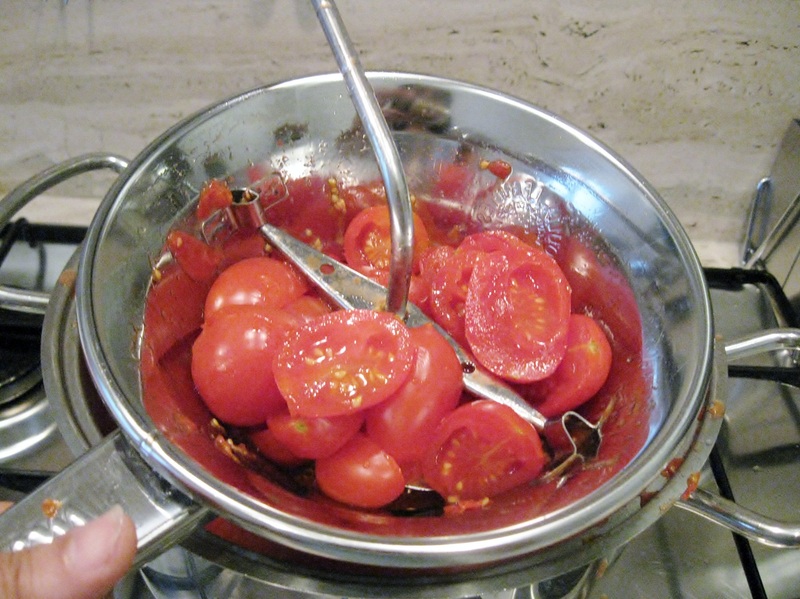 Once blanched, tomatoes are passed through a hand-held vegetable mill. 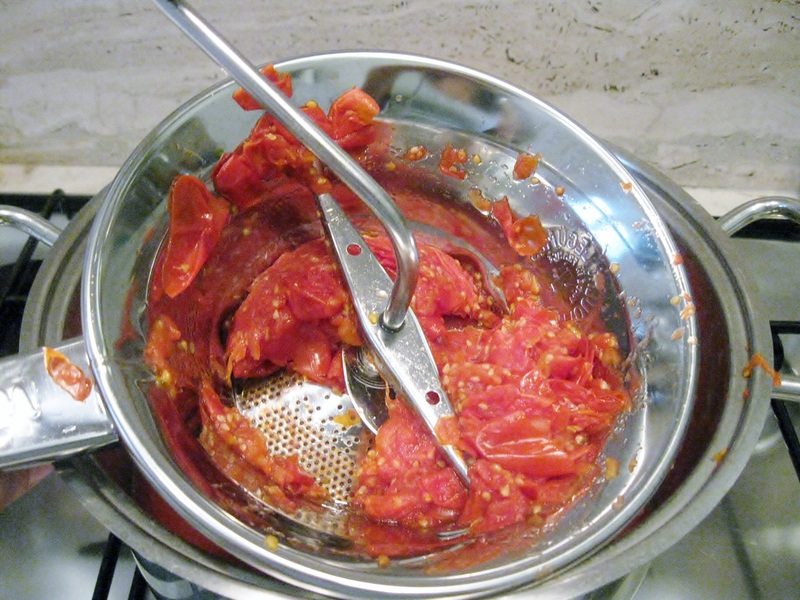 This useful tool besides from speeding up the process by easily removing skin and seeds (which determines acidity in tomato sauce) from tomatoes, it produces a sweeter and better quality of sauce. In a saucepan, add 2-3 tablespoons of olive oil, and sliced garlic. Add chopped onions and sauté for about 30 seconds. Add sauce and simmer for about 1 hour or until sauce is thickened. Add some basil leaves and salt and pepper to taste. 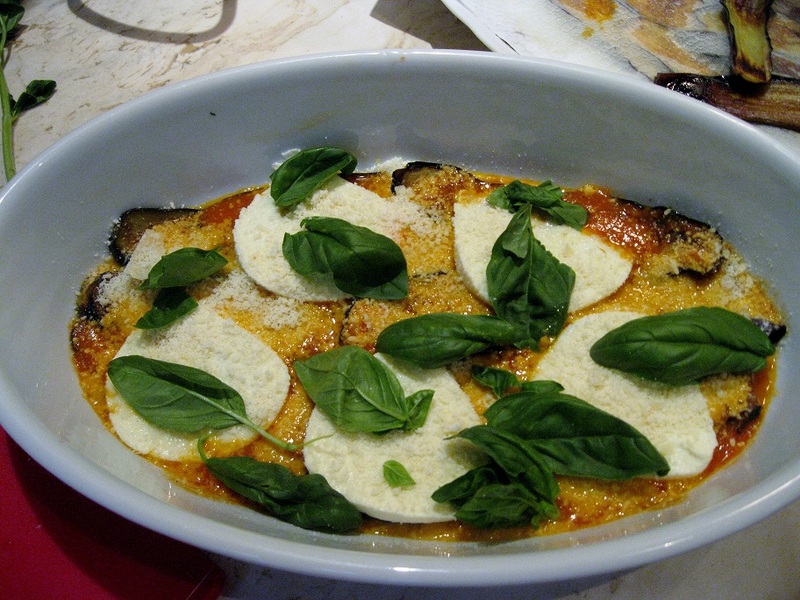 The type of cheese used in Parmigiana di Melanzane is crucial for the final result. 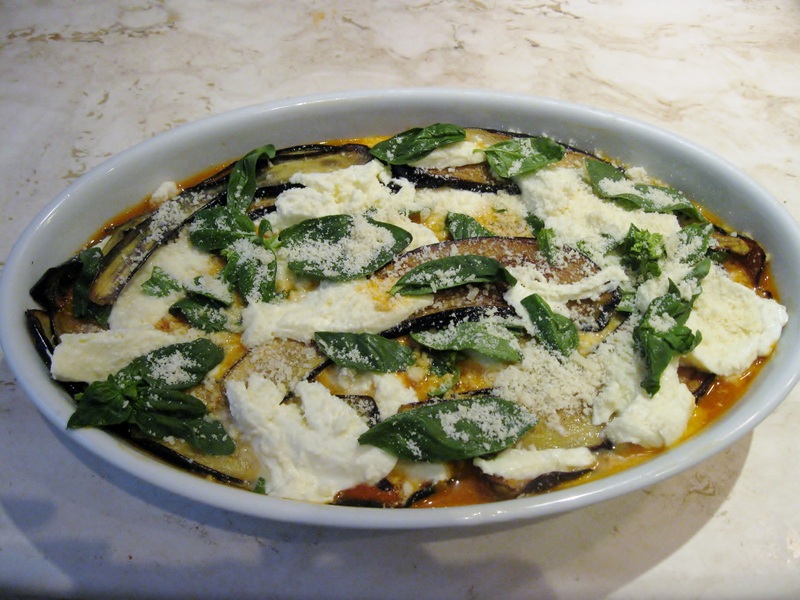 Since Buffalo Mozzarella usually has high levels of serum (which is a sign of freshness), Neapolitans do not use it in the recipe since Eggplant Parmesan would become soggy. Therefore, it is better to add sliced Fior di Latte, previously squeezed to eliminate excess liquid. Some Neapolitans even slice it, place it on a tilted plate, and leave it overnight in the refrigerator. 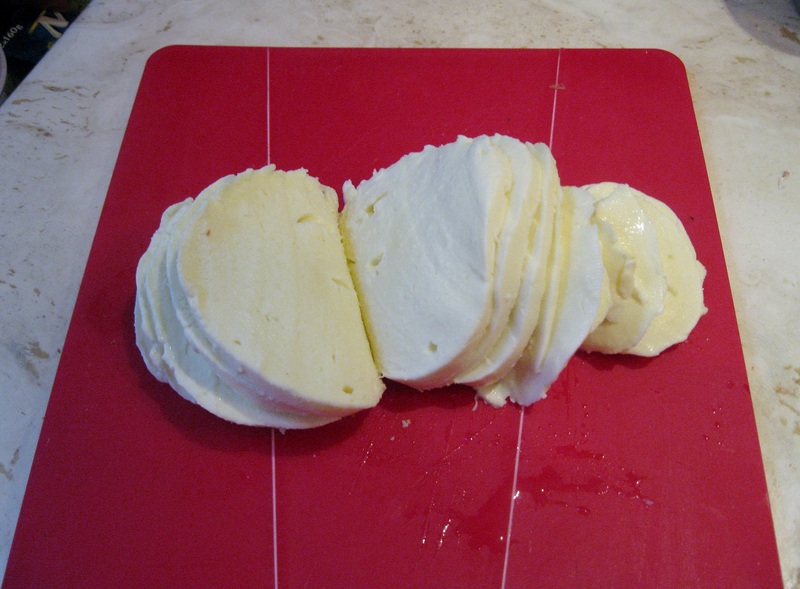 In Naples some people use Provola cheese, which is an even drier cheese than Fior di Latte. 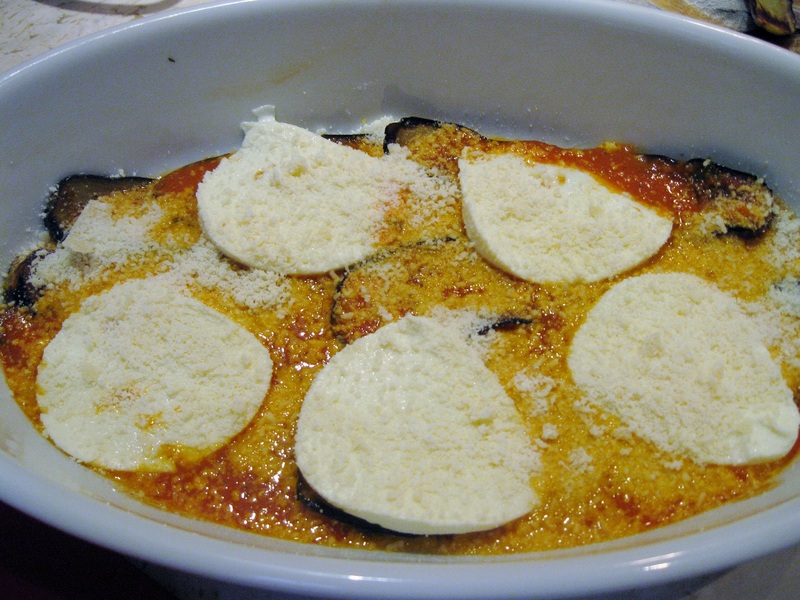 Arrange eggplant slices in the bottom of a baking dish (I used an oval baking dish ), overlapping slightly if necessary. Cover with Fior di Latte slices, and Parmigiano Reggiano. Add some whole basil leaves on top. 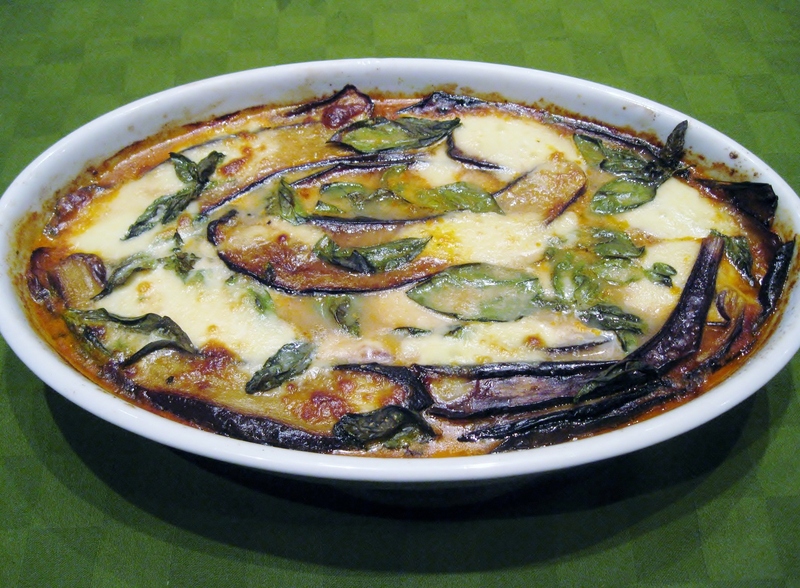 Continue layering with remaining eggplant, sauce, Fior di Latte, Parmigiano Reggiano, and basil. Bake at 200° C (about 400 F), uncovered, until cheese is melted and golden, about 30-40 minutes. It is very important to let it cool for about 30 minutes before serving to appreciate flavors better. I was beginning to think I was the only left who still constructed their eggplant parm. I’ve seen so many deconstructed recipes as of late. This is beautiful. I love creative cuisine, yet a lot of people do not cook traditional dishes anymore. Classic recipes are in risk of being extingished. It is time to protect and promote culinary traditions around the world, which are relevant to our cultures. Although my family is Calabrese, I make my tomato sauce and my Melanzane all Parmigiana exactly like you!! It´s got to be one of my favourite dishes…yum! That is right!! I guess it is a Southern Italian way of cooking: the simpler the better. This is also due to the fact that vegetables and fresh cheese have a better taste in the South!!! What a nice blog! Your photos are great and your food looks delicious. Thank you very much!!! I also enjoy yours and the great location you are blogging from! Giselle, I tried to make this and failed miserably. 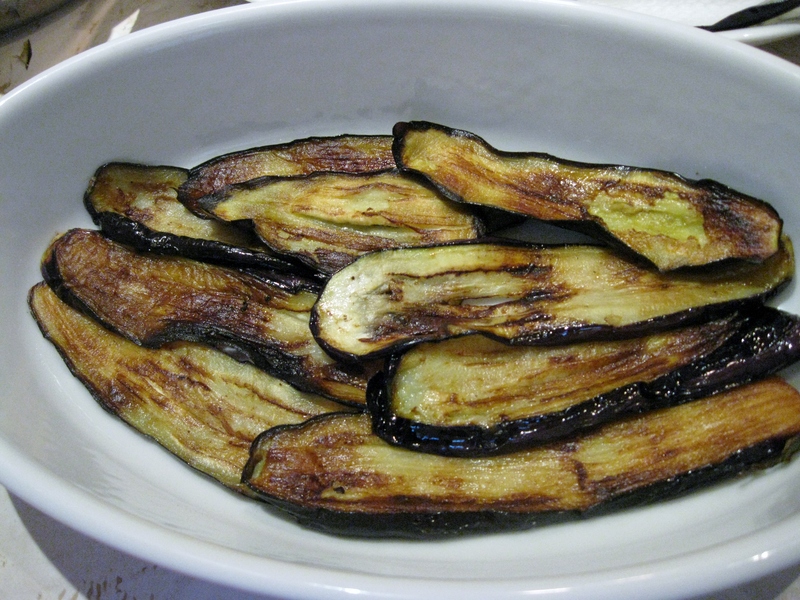 It was so salty… how much do you salt your eggplant to drain? Also does Italian eggplant differ that much than ole American Eggplant? When it’s done right, it’s such an amazing dish. I thought I was making a homerun, but it was just too salty 😦 any suggestions?? Hi! i salt eggplants lightly. Then drain then with enough water until salt is removed. You can also soak them in water. I guess most vegetables differ from one country to the other. A lot has to do with the soil, climate, altitude, etc. but I think this is not the issue. Consider that Parmesan cheese is salty, (especially if you add excess cheese) Mozzarella also has salt. If you salt your tomato sauce, you add more salt to your dish. 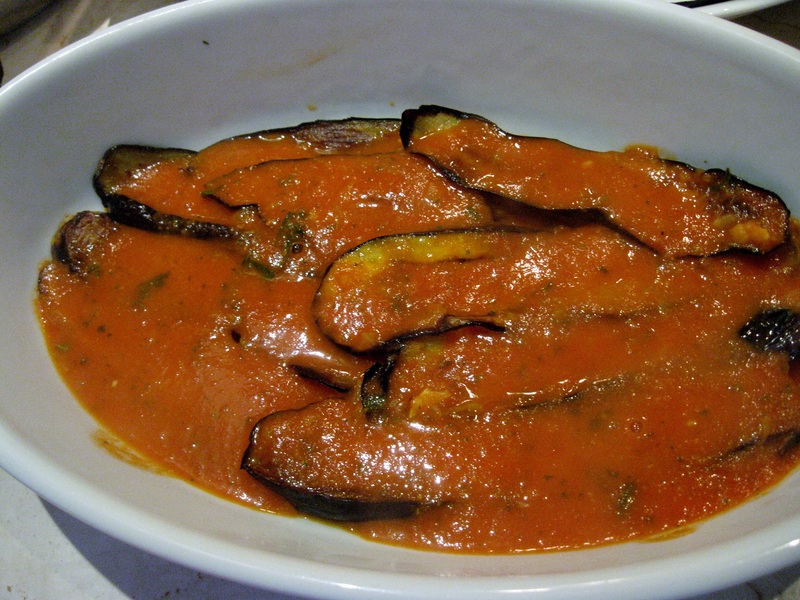 Next time drain eggplants very well, and add a little salt to your tomato sauce. try these suggestions and let me know how it goes!! !